Several scriptures make reference to the armor of God including 2Corinthians 10:4 - 5, Romans 13:12 and also 1Thessalonians 5:5. Our warring is with those wicked spirits, demons and Satan, whose sole purpose is to find weaknesses in us, exploit them, and have us not gain salvation. It is they, through influencing the governments of this world and humans that are not converted, who are the true rulers of our age (verse 12). We are to study the Bible and make it a part of our daily living, for from it we derive the strength of our armor. The Scriptures within us gives us the ability to "stand" or overcome what comes our way (verse 14). See, when we break these verses down into smaller verses, bite size pieces we can totally understand the meanings and why it is so very important for us to keep our armor on. For we do not wrestle against flesh and blood, but against principalities, against powers, against the rulers of the darkness of this age, [a] against spiritual hosts of wickedness in the heavenly places. Each of these have a purpose and a meaning. Principalities are over areas. Powers are over countries, Wickedness in heavenly places are demons in the area you are in. 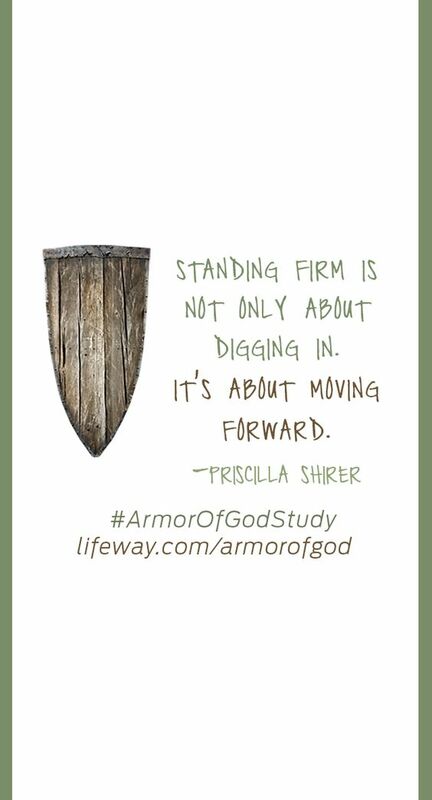 Priscilla Shirer tells us in her Bible Study on the Armor of God these things in her introduction. “All day, every day, an invisible war rages around you — unseen, unheard, yet felt throughout every aspect of your life. A devoted, devilish enemy seeks to wreak havoc on everything that matters to you: your heart, your mind, your marriage, your children, your relationships, your resilience, your dreams, your destiny. She also goes on to say this about that! Everything that occurs in the visible, physical world is directly connected to the wrestling match being waged in the invisible, spiritual world. We often give the Enemy too much credit for being impossible to defend or defeat. Prayer is the divinely authorized method that activates our spiritual armor and makes it effective. The belt of truth is your core support. It provides the essential backing you need when you're in the midst of spiritual war. When you're standing firm on the truth of God as revealed in His Word - when His truth is at the core of your existence - strength flows into every other area of your life. Roman soldiers wore the breastplate to protect the upper body and especially the heart. Wearing the breastplate could mean the difference between life and death. What the breastplate did for the Roman soldier's physical heart, righteousness does for your spiritual heart. Of all the things the enemy seeks to steal, kill, and destroy in your life, peace is almost always at or near the top of his list. Anywhere peace is lacking, the enemy is at work. We can’t always control the kind of ground were forced to march across. But we can still move forward when our feet are fitted with the preparation of the gospel of peace. Faith is one of the most overused and yet underutilized expressions in Christian circles. However, talking about faith is not the same as having it. Faith is an action. By definition, faith is not talking about or thinking about or even celebrating Gods truth. It is the process of adapting your behavior, your decisions, and ultimately your whole lifestyle so it accords with what has asked you to do-without needing to see the evidence that it will all work out in the end. The salvation experience is often reduced to something that only affects a person's eternal destiny. However, salvation is meant to come with more than future benefits. Salvation is not just a past event; it is also a present reality. The fact that Jesus lives means our salvation flows into the everyday experiences where we live. Ephesians 6:17 is clear - the sword of the Spirit is the word of God. As the believer puts on the full armor of God it includes this weapon that may be used for defense or offense against the schemes and lies of the Enemy. God's Word is an indispensable weapon for life. In this study of Ephesians 6:10-18 we see our adversary the devil and his schemes. Let’s look deeper and use Priscilla Shriver’s words for what he does in our lives. “Our enemy celebrates lethargic Christian living. When we’re giving up our relationships, disregarding the purity of reputations, yielding to our appetites without putting up much, if any, of a fight, he can basically go unchecked. Wreak havoc in the lives of God’s people. Ultimately he can hamstring the church from achieving the purposes of God. Our indolence and disinterest work to his great advantage, practically rolling out the red carpet for his entrance into the unlocked doors of our indifference and despondency. He’s hardly going to pass up an opening like that. Why do you think these are important to know? They are important because when we really are becoming deeper Christ followers, these demons will come after you. If you are walking in the Word and your life is walking like Jesus. I am not here to scare you, I want you to know Jesus, really know him. I want you to breathe in Jesus and breathe out the stress of life. 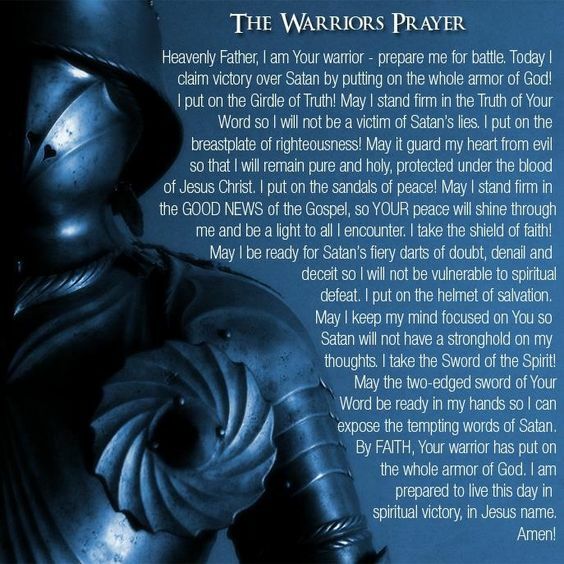 I want you to wear this armor proud and loud and ready for any and every battle the devil brings on. In this knowing Him, the devil will try to keep you away from Him. We will be taking apart the armor more so and see why exactly it’s the way it is. “These are critical parts of our spiritual armor. We are, by obeying these verses, wrapping ourselves in the power and strength of God. The loins in a human are the region of the hips, groin, and lower abdomen. As such, a very delicate part of the human anatomy and one if left unprotected and injured, can lead to serious consequences. Paul says here to gird (fasten with a belt or band) this part with truth. However, what is truth? Jesus, when praying for the disciples, said that Scripture was truth (John 17:17). The Bible represents the ultimate truth. If one is not living by it, then his or her life is incomplete and worldly. Living by the truth of God’s word on a daily basis will protect us from great spiritual injury which could lead to spiritual death (verse 15). As with the loins, if the feet or ankles of a soldier do not have armor and injured, he is at a great disadvantage because he cannot keep up with the rest of the army. The same is true with the way that a Christian walks. Is one constantly stepping on other's toes, thus creating strife? On the other hand, does that person create peace by what they say and how they walk? Besides all these, take up the shield of the faith, with which you will have the power to quench all the fiery darts of the wicked one (verse 16). As with a breastplate, the shield of a soldier is part of his armor used to ward off swords, spears, and arrows. Without the faith of Jesus Christ, a Christian will not have a shield to ward off the attacks of Satan and his demons. When we shield ourselves with righteousness, there is no evil spirit, not even Satan himself, that can touch us. There is no greater protection. As with the loins, the head is also an area that can suffer from a serious injury. Being that the skull protects the brain, it is quite vulnerable to injury in certain situations. A helmet will protect the skull and brain from injury. In like manner, once the Father calls someone to salvation, that person must put on this spiritual helmet of faith in order to maintain his or her calling. Now that we have read that, what is missing in our armor? Let’s read this together out loud as we go Bible digging. This isn’t just for kids, it’s for us too. We have about 5 verses if not a few more to look up. Let’s go to Psalm 2 and what does it say? It also can protect us from Slander and Gossip. How many times do we listen to what others say about someone else? Or cut someone down? Let’s see what the Word says about that. Let’s turn to Ephesians 4:29. Lastly for today’s look. It is protection from Perversion Psalm 119:37. In all our looks at the armor, we are missing something major. Why do you think that is? And what is it? What struggles do you have? If not these what about self-talk? What about your view of yourself? How do you view yourself? For me, I am not always so great to myself, I have had to pray off a lot of stuff to keep me above the ruts in the road. Scripture tells us that our enemy, the devil, is filled with great wrath, it says so in Revelations 12:12. He knows that his time is short. Have you ever felt like you are just ready for battle? Or are you battle weary? Dealing with your own life and it’s sometimes just tiring. Well, as we go through this lesson for the next 3 weeks, we are going to gird up and watch our spirit soar through and take on what we have been walking/running away from. How many of you are filled with the Holy Spirit? So, today we talked about the things of our head and our mouth at the beginning. I am a believer. I am your child and you are my Father, Jesus is my Lord. I believe with all my heart your word is true. Your Word says that if I will ask I will receive the Holy Spirit. In the name of Jesus Christ, my Lord, I am asking you to fill me to overflowing with your precious Holy Spirit. Jesus Baptize me in the Holy Spirit, Because of Your Word, I believe that I now receive and I thank you for it. I believe that the Holy Spirit is within me and by Faith I accept it. Now Holy Spirit, rise up within me as I praise my God. I fully expect to speak with other tongues as You give me the utterance. Thank God and Praise him for Baptizing you in the Holy Spirit. From this Moment on you are a Spirit Filled Baptized Believer. God your word says in Romans 8:26 Likewise the Spirit also helpeth our infirmities: for we know not what we should pray for as we ought: but the Spirit itself maketh intercession for us with groanings which cannot be uttered. Why do you think it is important for us to know who the Holy Spirit is? Do you think he comes in automatically when you are baptized or saved? I think a bit of it comes but because we should be saved and baptized at the same time, I believe we need to also be baptized in the Holy Spirit as well. I believe this is part of the armor we need. Because we need to have the Sword of the Spirit, this is so important to keep our battle gear safe. At this time, we are going to be praying for some specifics to see what God desires from us. How many of you have learned something new? How many of you are ready to go with your armor shined up and ready now? 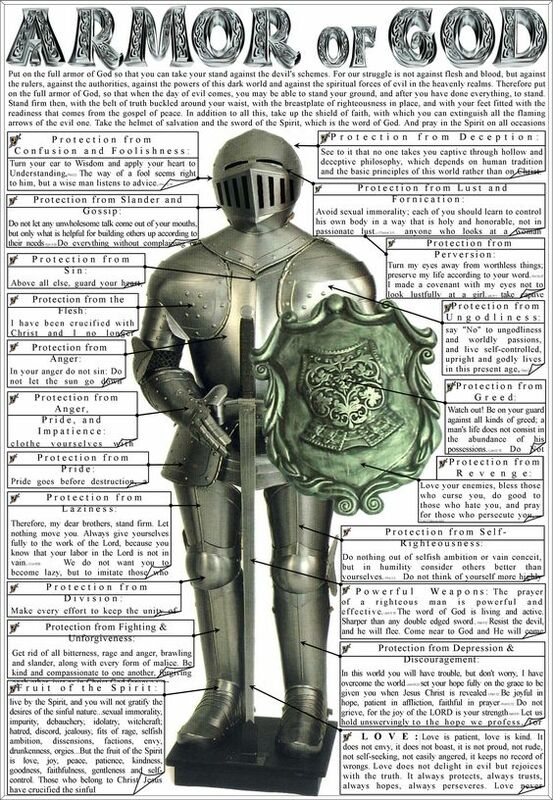 Next time we will continue on the Suit of Armor; the last two classes we will talk about the Sword. What you have just read is my first class. I will post my second one soon. Please send them to FB CAMP Saints No Walls Ministry and let me know what you think.